For the most part, I enjoy being me. I now understand after years of fighting to be like someone else, it was never God’s intention that I be anyone but myself. I fought it for years, seeing only my shortcomings and rarely my strengths. But somewhere along the way, I figured out God can use our weaknesses just as well (and sometimes better) as our strengths. In the comments section, Bonnie and Melissa Rae asked about the line, “But somewhere along the way, I figured out…” How did I figure that out? There’s not a short answer to this question. It’s been a process. It continues to be a process. The journey began innocently enough. I was 24 or 25 years old. I was watching a segment of 20/20 about Attention Deficit Disorder in Adults. I’d never even heard of ADD, but as I watched the stories of others struggling with the same feelings of inadequacy, low self worth and pain, I knew without a doubt they were describing me. I wasn’t looking for excuses, I was looking for hope. That was a major turning point. I was approaching life completely wrong. I was attempting to gauge my self worth based upon what others thought of me. In that epiphany moment, I understood what I believe is a core truth: You can be surrounded by loving, supportive, caring people (or not) and yet you are still ultimately alone in this world. We are created to live in community with one another, yet at the end of the day, it is you and your Creator who understands the depths of your soul. Strip away all the things people think define you, and you are ultimately left with what you know to be the truth. That despite how flawed you may be, God put you on this earth for His glory, and He has already equipped you with the tools you will need. It is up to you to hone these tools, and get to work on your Father’s business. 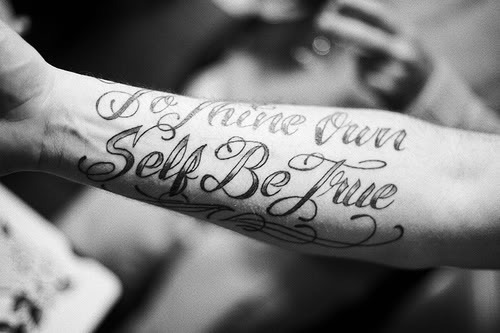 “To thine own self be true?” Yes. Absolutely.